Easily one of the most important aspects of growing large healthy plants is choosing the correct container. For more than 30 years fabric grow bags have proven to be one of the best choices for gardeners both commercially and independently. The soft sided aeration containers commonly known as Smart pots, grow bags, fabric pots have been proven and multiple University tests to improve the routing structure of your plants. This improved routing structure results in larger healthier plants with greater yields. 1. Excellent growth environment. These soft sided growing containers are far and away better than there are hard sided plastic counterparts. These plastic nursery pots are inexpensive but do not offer the ideal growing conditions for your plants. Nursery pots do not allow for proper aeration of the soil, holding in heat and offer low amounts of drainage. On warm summer days these plastic pots can easily top temperatures above 130° causing extreme and unnecessary stress. This stress will effectively kill the roots of your plant and inhibit growth. Many gardeners also struggle with watering, both too much and too little. If you are on the heavy side of watering and tend to water too much plastic pots offers very little drainage and can lead to root rot. These fabric grow bags are very porous allowing for excess water to be drained and excessive heat to be dissipated. 2. Cost savings on growing media. The because of this effective adoration in fiber grow bags a gardener can benefit from using a less expensive and heavier growing media. Growing media which is lite and with high drain ability is largely meant to protect from over watering, this lite growing media has many additives such as perlite to improve drainage. These additives cost money and increase the price of your growing substrate. With soft sided fabric pots helping control moisture levels these liter and more expensive growing media’s are less critical. 3. Healthier roots and larger plants. Root pruning is a technique used by many large commercial nurseries which effectively produce larger highly branched routing systems. These rooting systems with more branches allow for more nutrient and water uptake. When your plants are grown in fabric grow bags the roots are trained to branch instead of wrap. Root wrapping happens when plant roots reach a side of a hard sided container and continue to grow in length but do not branch. This is very undesirable as the plant can effectively strangle itself. 4. Lightweight and easy to move. 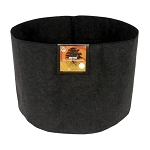 In addition to being better for the rooting system fabric pots are also lightweight and strong. Pots such as ceramic or clay offer a better installation then there plastic counterparts but tend to be large bulky and heavy. If you have any desire to move your plants around then ceramic or Clay pots are not for you. 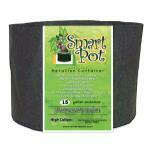 These pots also do not offer aeration and root pruning. 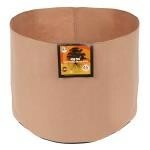 Fabric pots are lightweight, durable and much easier to move and ship. 5. Advanced raised beds. Traditional raised bed gardening can be an excellent way to provide a great growing environment for your plants. Typically these raised beds offer great water drainage and cooler soil temperatures than conventional nursery pots. Unfortunately traditional raised beds also require installation labor and increased monetary investment. Large grow bags are essentially an advanced raised bed. Larger fabric growing containers have the ability to grow any type of plant you would typically find in a traditional raised bed garden. Plants such as potatoes, tomatoes, watermelons, cantaloupes, lettuce, celery, carrots, basil and many others thrive in the fabric smart part growing environment. 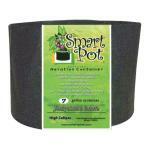 The fabric pots which can be found here are made of an inert fabric and are completely safe for edible plants. The fabric grow bags which we offer come in a large variety of sizes starting at the 1 gallon size and going all the way up to the special order 1000 gallon Smart pot size. For a complete chart on benefits features and sizes please see our comparison chart section which can be found at the top of the page. Thank you for shopping with us and happy gardening.